Mike Cross and his family from Georgia chartered the Topshotfishing team to do some deep sea big game sport fishing in Fort Lauderdale, Florida. As the Cross' boarded the boat, they were welcomed on board by the Topshotfishing team and were asked what they would be interested in catching. Mike's son, Matthew, replied he would like to catch a Sailfish. Fifteen minutes after leaving the dock, lines were in 120 ft. of water by the sea buoy in Fort Lauderdale, 1.8 miles from shore. We started out trolling with two #8 plainers, one with a 3 � blue reflector drone spoon and the other with a pink and blue sea witch in front of a double hooked Bonito strip. For surface baits, we went with four Ballyhoos. As we trolled the reefs ranging from 80 ft. of water out to 200 ft., Mike and his son took turns bringing in their catches. From there we decided to do some live bait fishing. We put out two bug lines looking for some Bullets. After Matthew caught six Bullets, we used them as live bait and set up close to one of our wrecks in Fort Lauderdale in 145 ft. of water. Right long � he is getting nervous, as the Bullet tried frantically to get away from the predator. Sailfish hooked up!!! Matthew hopped into the fighting chair to do battle with his dream fish. The young angler did a fantastic job while playing tug of war with the Sailfish. 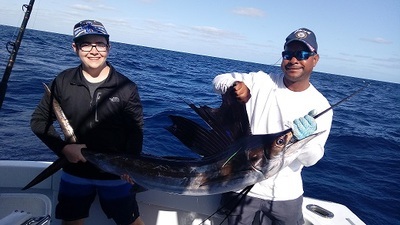 He brought the Sailfish to the side of the boat, and Dave, our mate, tagged the Sailfish, pictures were taken and the Sailfish was released � hopefully, the fish will be captured again so that the info on the tag will reveal where he was caught and how much weight and length he gained. Matthew's enthusiasm was very high with his accomplishment of catching his dream fish. It was time to head back to the dock. The anglers retired into the a/c salon and enjoyed the relaxing trip back to the dock at Bahia Bar located at 801 Seabreeze Blvd. Fort Lauderdale 33316.